When an organization first decides to invest in better knowledge management, the team in charge often struggles to prioritize knowledge needs and select the right combination of tools and approaches to address them. Different parts of the business have different requirements, and it’s hard to please everyone. There is also a massive range of potential solutions, which can feel overwhelming without a strong basis for decision making. And it’s not just a question of picking the “best” option: Decisions must be made in the context of a given budget and timeline, existing processes and technologies, and the broader organizational culture. Even if a KM team manages to get the initial mix right, things don’t stay the same forever. Over time, the knowledge management program may expand and mature, business priorities may shift and new technologies may emerge. Because of that, the KM team needs to revisit its goals, approaches and resource allocations periodically to ensure they remain aligned with business needs. Member-based nonprofit APQC has developed an eight-step KM portfolio assessment process to help organizations select the right mix of KM approaches and then evaluate and adjust their KM suites over time. The process begins when a KM team works with business leaders and stakeholders to ascertain current knowledge needs throughout the organization. Once those needs are identified, the team can determine the range of KM approaches that could be applied to address them. A thorough examination of each candidate KM approach’s applicability, feasibility and potential implementation issues allows the KM team to narrow the options and pinpoint the best possible approach to apply. The team then provides a recommendation to relevant business owners and with their input, refines and implements the designated approach. The final step is to circle back with the affected business groups to determine whether the approach that has been implemented sufficiently addresses the needs and whether knowledge needs have shifted since implementation and require new solutions. Step 1: Understand the knowledge needs of the business. Ensure that the KM team understands the knowledge needs of the business areas and groups it supports. Knowledge managers have multiple options to gather the feedback required to understand and prioritize those needs. For example, they can interview business leaders, facilitate a planning session with key stakeholders, conduct a survey or ascertain needs based on existing documentation and observed behaviors. In addition, team members may be aware of emerging challenges or opportunities in the organization or external market that can help them anticipate probable future knowledge needs. Is there a current knowledge-related problem or opportunity? Are there changes coming in the business that could create knowledge-related challenges or opportunities? What knowledge will you need to help you innovate and meet long-term customer needs? What market differentiator(s) can be improved if knowledge and expertise is better shared and transferred? What is the timeframe for the opportunity? Depending on context, the KM team may want to pose additional questions about the long-term business strategy and specific business imperatives such as anticipated mergers or acquisitions, new investment opportunities or imminent loss of key staff. It is important to probe for hidden or looming knowledge needs, rather than simply accepting the first issues that come up in conversation. APQC also recommends asking follow-up questions to delve into the context, severity, scope and urgency of each need that emerges. Based on the data it gathers, the KM team should be able to develop a prioritized list of business needs that it can help address. Step 2: Decode business needs into KM needs. Once the KM team has a prioritized list of knowledge needs from the business, decode those business needs into the language of knowledge management. 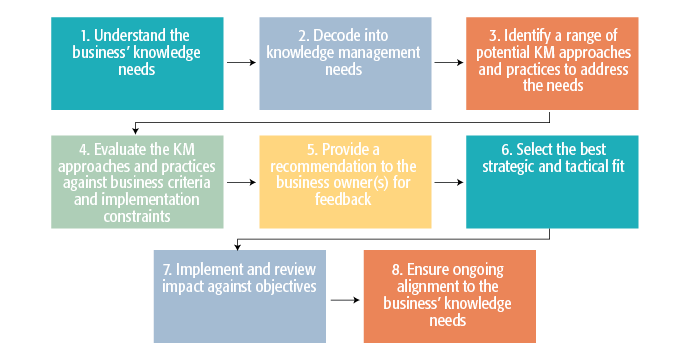 Most business knowledge needs can be categorized under one of five classic KM needs: the capture of critical knowledge, collaboration, knowledge transfer and reuse, expertise location, and search and findability. Those needs, in turn, are associated with KM approaches such as communities of practice, after action reviews, expertise profiles and content management systems. Linking each business need to a KM category is the first step to identifying suitable approaches and practices. For example, a stakeholder might say, “We need employees to be able to find an expert or answer quickly when a problem arises out in the field.” The KM team would quickly recognize that it falls under the KM need of expertise location. Based on the requirements outlined by the business, the team can delve into the specifics of the need and start identifying potential options to address it. Step 3: Identify a range of potential KM approaches to address the needs. Now the KM team can brainstorm potential solutions using its own expertise and external references. APQC recommends that KM teams be creative and open-minded when exploring ways to address a given knowledge need, rather than focusing too much on the current capabilities available within the organization or other business constraints (those factors will be addressed later). It’s important to consider the range of what’s possible—from quick, inexpensive fixes to complex, multifaceted approaches. The optimal solution may not be the most obvious or the one that requires the fewest resources to implement. For example, consider the expertise location need described earlier. The organization might be able to satisfy that need with a small-scale improvement, such as the creation of online training modules to teach employees how to find relevant content and experts when they experience a problem. However, if expertise information isn’t documented anywhere, the solution may be more complex and labor-intensive. The KM team might want to build functionality that enables employees to query a community of experts and colleagues via a discussion forum or social network, or it might want to develop a system of searchable expertise profiles where employees can filter to find colleagues with specific knowledge.